For years, Ms. Poman Lo has dedicated herself to the tourism and hotel industry and philanthropic causes in Hong Kong. To celebrate her winning of ‘The Ten Outstanding Young Persons of the World 2014’, the launch party of Bodhi Love Foundation was held in Regal Hong Kong Hotel today, joined by our ‘Love Ambassador’, Mrs. Jingjing Guo-Fok, and our guests: Mr. Stephen Chan, Mr. Alex Fong, Mr. Raymond Wong, Ms. Abbie Chan, Ms. Sharon Kwok, Ms. Sally Wu, Mr. Tsang Hei Chiu, Ms. Janis Chan, Ms. Melody Kwok and Mr. Wilfred Ng. Chairman and CEO of Regal Hotels International Holdings Limited (RHI), Mr. Y.S. Lo, was also present at the party to support his daughter, Ms. Lo. Ms. Poman Lo takes a group picture with the Outstanding Persons of Hong Kong. Ms. Lo was named ‘Hong Kong’s Outstanding Student’ at the age of 14, making her the youngest winner ever. She is the first and only Hong Kongese that has won ’Hong Kong Outstanding Student’, ‘The Ten Outstanding Young Persons of Hong Kong’ and ‘The Ten Outstanding Young Persons of the World’ and the second Hong Kongese since 1995 to be awarded in the business, economic, and/or entrepreneurial accomplishment category. The Chairman and CEO of Regal Hotels International Holdings Ltd., Mr. Lo Yuk Sui, singing ‘You Raise Me Up’ with Bodhi Love Foundation Founder Ms. Poman Lo, Ms. Sharon Kwok, Mr. Alex Fong and a children’s choir. Ms. Lo received the Angier B. Duke Scholarship from Duke University at 15 and graduated with a B.A. degree in Psychology (with 1st class honours) at 19. After her graduation, she came back to Hong Kong and took over her family businesses in real estates and hotels. With her business innovation and low-cost, high-benefit marketing strategies, Ms. Lo successfully developed a luxury estate, Regalia Bay, and made it a much sought after purchase amongst property buyers. So far, Regalia Bay has attracted a great number of wealthy people and celebrity residents and brought in considerable revenue for the group. 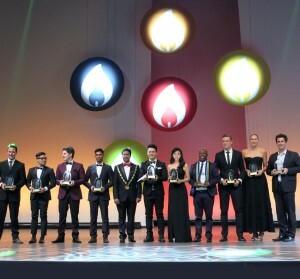 Ms. Poman Lo poses with the other honourees of ‘The Ten Outstanding Young Persons of the World’. As the Vice Chairman and Managing Director of RHI, Ms. Lo has proactively launched multiple development programs (include many hotel renovations) and established iClub, a select-service hotel brand designed for optimum functionality for the self-sufficient, tech savvy travellers. iClub is the leading innovator in the hotel industry, the first carbon-neutral hotel brand in Hong Kong and the first to use ‘Mobile Key’ technology, a simple and secure way to access hotels room with mobile phones without having to check-in at the front desk. Regal Airport Hotel, another brand under the management of RHI, has been named ‘The Best Airport Hotel in the World’ for 7 successive years by Business Traveller and 4 successive years by Skytrax. As of now, RHI has 24 hotels under its management. to congratulate Ms. Poman Lo. In 2014, Ms. Lo was elected Chairman of The Outstanding Young Persons’ Association Hong Kong and appointed many official titles by the Government of the HKSAR, such as Committee Member of Quality Education Fund and Court and Council Member of the City University of Hong Kong. In addition, she plays an active part in social welfare and hold important positions in a number of NGOs and charity organizations. Even though she has achieved great success in her career, Ms. Lo, a young entrepreneur, stays focused on her goal of instilling positive values in the next generation. She has created a much-loved cartoon characters based on her beloved pet dogs and published a collection of Bodhi and Friends comic books to instill and inspire positive virtues in children. The revenue from the comic books is donated to philanthropic causes. Ms. Lo founded Century Innovative Technology Limited (CITL) in 2012 and has developed Bodhi and Friends into an animation and game brand. Bodhi and Friends has won numerous awards, including the 2013 Shenzhen’s Top 10 Original Animations Award at the Shenzhen Animation Festival, the Golden Lotus Award for Best Animation at the Macau International TV Festival, and the Golden Dragon Award at the 11th China Animation & Comic Competition Golden Dragon Award. CITL has its eye on nurturing positive values and multiple intelligences in children aged 2 to 8 years worldwide. Ms. Lo aims to build Bodhi and Friends into a global edutainment brand loved by children and trusted by parents. The BodhiWorld platform is positioned to be the world’s leading children’s edutainment community providing only the best multimedia content and a pleasant learning experience in a safe environment. Bodhi and Friends’ educational products combine the best of Eastern and Western pedagogy to create international-level innovation in education and game design. The aim is to help children develop positive values and multiple intelligences and teach children moral values, wisdom, compassion through the use of interactive media. Based on the core values of The Outstanding Young Persons’ Association, Ms. Lo launched Bodhi Love Foundation to offer underprivileged children equal access to education and inspire them to chase their dreams. As an Outstanding Young Person, Ms. Lo has become a role model for the youth. She has devoted relentless efforts in inspiring wisdom and compassion in children and developing them as future world leaders. Bodhi Love Foundation will continue Ms. Lo’s philanthropic spirit and use technology to help children access education equally. Ms. Poman Lo attends the ceremony for ‘The Ten Outstanding Young Persons of the World’. During the ceremony, Chairman Lo Yuk Sui touched the hearts of many when he sang ‘What A Wonderful World’ and ‘You Raise Me Up’ as a show of support for Ms. Lo. The chairman took the opportunity to remind those in attendance of the messages in those songs – to love one another, not take things for granted, and make the world a better place. Chairman Lo proved he walks the walk by donating HKD 1 million to kick off the Bodhi Love Foundation in order to continue Ms. Lo’s philanthropic efforts. 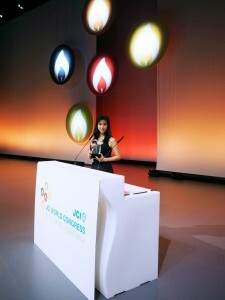 Ms. Poman Lo receiving her award for ‘The Ten Outstanding Young Persons of the World’ at the ceremony in Germany. Bodhi Love Foundation is honoured to announce famous Chinese diving champion Mrs. Jingjing Guo-Fok as the Love Ambassador for the charity program. Mrs. Fok, who has won the most Olympic medals out of any female diver, has been very involved in charities since her retirement from the sport. She has proven to herself be a kind-hearted role model for young people and is the pride of the Chinese people. Between now and December 31, the video of the ceremony can be found on the exclusive Regal Hotels Youtube channel – ‘Channel R’. To find out more about Bodhi Love Foundation, check out www.BodhiLove.org. Register as a member of the site and give underprivileged children a chance to learn English. Show your support for the cause by creating a slogan and sharing our Facebook or Weibo page and stand a chance to win a 6 day 5 night stay in Barcelona with flight tickets included for 4 persons. For more information, please visit www.BodhiLove.org.